Jane and Gavin McDonald lived on a big farm with their mom and dad. They had horses, pigs, goats, chickens and ducks. Jane kept a few pet mice and Gavin had two cats and two dogs. Their dad fed a moose that lived in the woods near the farm. It came to visit every day. One day Gavin found a hippo in the pond and his dad said he could keep it. Jane and Gavin's dad owned a big green truck. They loved to go for rides in it. One day Mr. McDonald needed to take the animals and move them from one part of the farm to the other. He did this now and then so they didn't get bored seeing the same thing day in and day out. He put all the animals in the back of the green truck. “Hop in, Jane and Gavin. I'll give you a ride and you can help me with the animals,” Mr. McDonald said. Jane and Gavin ran to the truck and climbed in. 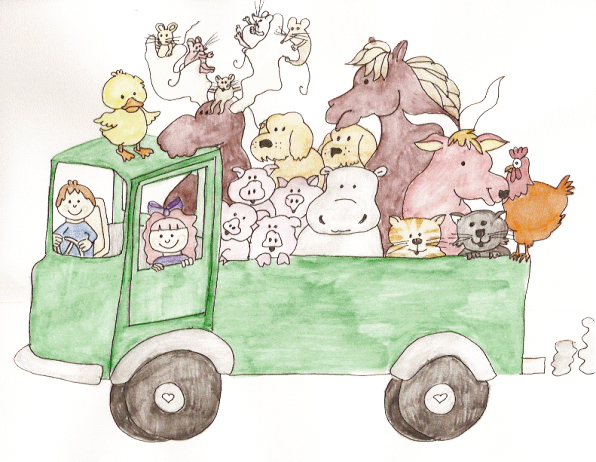 They saw all the animals in the back, crowded together, waiting patiently for the drive. “Wait just a minute. I've got to go and tell your mom something.” Mr. McDonald left Jane and Gavin in the truck with the engine running. “Jane, I think I can drive this truck. Should I try?” Gavin grabbed the steering wheel. “What? You don't know how to stop it? We'll crash and get hurt.” Jane's face t urned white with fear. Gavin steered as well as he could. He went around the corners. The pigs started oinking. The horse neighed and the cats meowed. “You told me to do it. Anyway, I don't know how to stop it.” Gavin looked for the brake. “Children! Stop!” Mr. McDonald ran after the truck. Luckily for him it was going very slow and he caught up with it. He pulled open the door and jumped inside just as the truck was ready to crash into a wall. He slammed his foot on the brake and it jerked to a stop. The dogs barked. The duck quacked and flew out of the truck. “It's a good thing I caught you. You should know better than to drive the truck.” Mr. McDonald scolded his son. “You left it running, Dad. I thought I could drive it.” Gavin was near tears. Jane and Gavin jumped from the truck. Their dad opened the back and all the animals ran out. The hippo ran to the pond and swam about until he found a muddy spot. The horse nibbled on hay and so did the moose and goat. The pigs oinked and looked for a pile of mud. The dogs chased the cats and the cats chased the mice. “We'll come and feed them every day and you can play with them. They'll be happy here.” Mr. McDonald watched the animals. The ducks quacked and waddled to the pond and the chickens went to find bushes to lay their eggs. Every day Jane and Gavin went with their dad to feed the animals, but they always let him do the driving.